What is it that strikes a spark of humor from a man? It is the effort to throw off, to fight back the burden of grief that is laid on each one of us. Humour is a strange thing. I have a close friend I’ve known since high school but our senses of humour are totally different. When she tells me that she particularly loathed a comedic film and was bored senseless, I just can’t wait to hustle over to the movie theatre and see it for myself. Especially if she found it mind-numbingly tedious and dull. It’s the best review she could have given me. Why? Because I know that there’s an excellent chance that I will find it hilarious. Director Wes Anderson is one of my favourite film makers. There are three of his films that I adore and never tire of watching, The Royal Tenenbaums, The Grand Budapest Hotel and The Darjeeling Limited. But even though I love these films, I’ve met a few people who just don’t get Anderson’s brand of humour. What is it that makes something funny? And how is that that taste in humour is so variable, even among close friends who have similar tastes in just about everything else? Mark Twain – American writer, humourist, entrepreneur, publisher, and lecturer – was a very busy gentleman who spent a lot of time thinking about what made people laugh. He kick started his incredibly successful writing career with a deceptively simple story about jumping frogs. It was first published in New York’s Saturday Press in 1865 and then it developed a life of its own and was reprinted right across the country. For some reason jumping frogs really tickled America’s funny bone and after that folk just couldn’t get enough of Twain. Unfortunately Twain had many setbacks and failures in life. Having made his pile he promptly became addicted to risk and invested in dodgy enterprises that failed and cost him millions. But he never lost his sense of humour. I came across professionals who’d researched humour and there was some consensus in their results. Apparently, those of us who are suspected of possessing a sense of humour, tend to see the world through a different lens and we’re also attuned to the absurdities of life. McGraw went on to say that people who are emotionally intelligent are in touch with their own experiences, as well as the experiences of others. Apparently they have the ability to combine seemingly unconnected ideas in a way that generates laughter. In a recent interview (The AGE Oct 11 2018) Jim Carrey talked about his ability to attend social functions or sit at the dinner table with friends and be the person who senses the unspoken – the elephant in the room. That is, he intuitively knows what’s on everybody’s mind at a particular moment. Carrey describes it like being like a cliff diver, he makes a snap decision about whether to seize the moment and make an impromptu jest – or simply let it go. 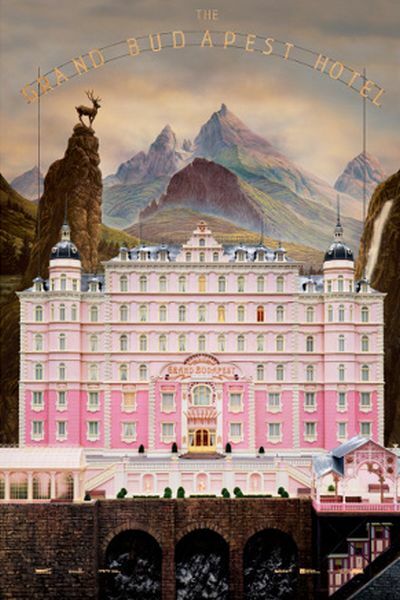 Photograph: movie poster for The Grand Budapest Hotel. If only it were possible to take the funicular railway – or even better a black vintage Rolls Royce – to the Grand Budapest Hotel. And upon arrival, be invited to dine with Monsieur Gustave H, Dmitri Desgoffe und Taxis, Madame Celine Villeneuve Desgoffe und Taxis, Agatha, Zero, the Young Author and Monsieur Chuck.